I had heard so much about the book Sunday Suppers at Lucques by Suzanne Goin that I finally got a copy last fall. There’s always a backlog of books I need to read, so I only just got through it a month ago. If you’re not familiar with it, the book showcases meals from the restaurant’s Sunday night, set-menu dinners. 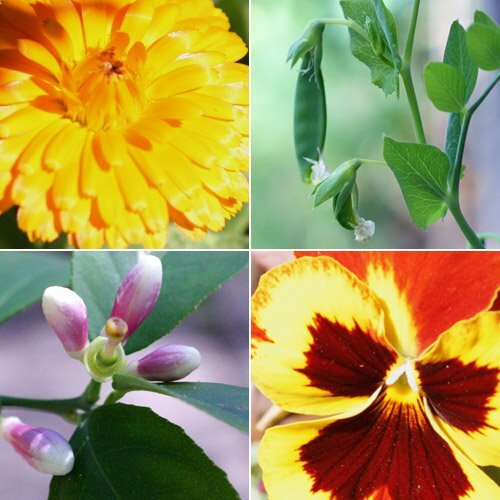 It’s organized by season as the food is true to Goin’s interest in using locally-grown, perfectly fresh produce. 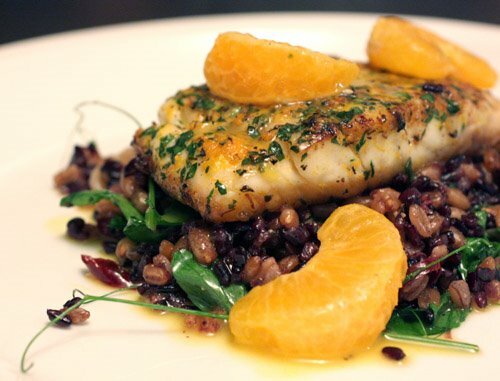 When I was reading the book, one dish after the next piqued my interest, but the one I absolutely had to have first was the wild striped bass with farro, black rice, green garlic, and tangerine. This just sang of spring to me. It looked fresh and bright and luscious in the photo with the tangerine sauce and segments. So, to celebrate the start of the season I made this on Saturday with just one minor alteration. I never see wild striped bass in my local stores, but I learned that I could make a special request for it at Whole Foods. Unfortunately, I learned that too late so I proceeded with snapper instead of bass. An issue that required some planning ahead with this dish was the black rice. There is a list of sources in the book which includes one for the rice, but I found Italian black rice on Amazon and purchased it there. Italian black rice, check, farro, check, believe it or not, green garlic was ready and waiting in the produce department of Central Market, so check for that too. Then, in an effort to buy back some carbon footprint from the flown-in rice, I snipped the pea shoots from my garden and used a local viognier from Becker vineyards. Viognier actually does very well in Texas, and this is one of a few good locally grown and bottled options. When I arrived home with the snapper, I set about seasoning it with tangerine zest and thyme and parsley from my garden. The fish then rested in the refrigerator for about four hours. The rice and farro were cooked separately but similarly with olive oil, onion, bay leaves, wine, and water. Some chile de arbol was added to the rice while the farro received some thyme. Once cooked, both were poured out onto a baking sheet to cool. To complete this part of the dish, sliced green garlic and sliced chile de arbol were sauteed in olive oil before the farro was added. After the farro toasted some, the rice was incorporated and then the pea shoots were added just to wilt. I finished this part and let it stay warm on the stove while then cooking the fish. The snapper was removed from the refrigerator and allowed to come to room temperature before being quickly seared in olive oil. After a few minutes on each side, it was removed, and the pan was wiped clean. The sauce was a simple reduction of tangerine juice into which butter was whisked and salt and pepper and tangerine segments were added. 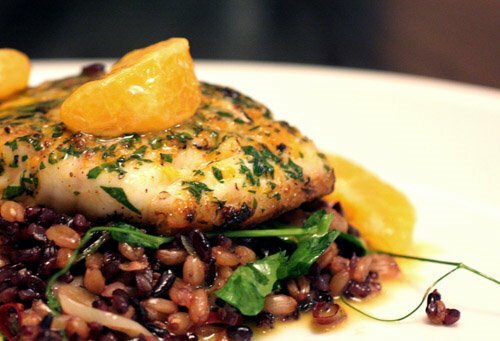 The fish was placed atop the rice, farro, and pea shoots, and the tangerine sauce and segments were spooned over all. I had thought about this meal for so long that I really took my time in preparing it. I wanted to make sure I didn’t blank on any crucial steps in the instructions. I have to say again that it just looked so great in the book that I had really worked up high expectations. And, yes, it was that good. The sauce was brightly fruit flavored and not too rich, and the farro and rice were chewy and substantial without being heavy. The chile de arbol and green garlic added nice pops of flavor, the pea shots were freshness itself, and the fish was light and nicely seasoned. Now, I’m planning other ideas for black rice and farro with asparagus and who knows what else, and I’m looking forward to trying more things from this book throughout this spring and the rest of the year. Great recipe and gorgeous dish! I've never cooked with green garlic before - sounds good! I love the tangerine here too. Lisa this dish seems AMAZING! Never heard or seen black rice before. The colors are fantastic.This combination of all those ingredients is new to me but I've started to crave for it now. What a gorgeous plate with the orange and the black colors playing off one another. I bet it all tastes heavenly, too. I made this recipe last spring and LOVED it! I think this is my favorite cookbook. You know how much I love Sunday Suppers at Lucques! I made a farro salad this weekend, however, had a tough time finding farro, so substituted freekeh, which worked out well. I will try this great looking fish dish. Great job on this dish! I know her recipes are incredibly labor (and dish!) intensive, but that they also turn out wonderfully. I almost made that farro recipe last week. Good to know that it was as good as it sounds. Wow - what a beautiful dish and amazing flavor combination! Thanks for the book recommendation - I'm going to check it out! Delicious & healthy too, Lisa!! This is superb!!!! I bet it tasted fabulous!!! Wow!!! We make red snapper for the first time this weekend, and it's a really good fish. A great surprise. This would be a good recipe to test. those photos are insanely gorgeous. i love them all! i've never tried black rice! i'll add it to the list! The tender care you put into the dish really shows, it's gorgeous!! There are new ingredients here that I have to try. 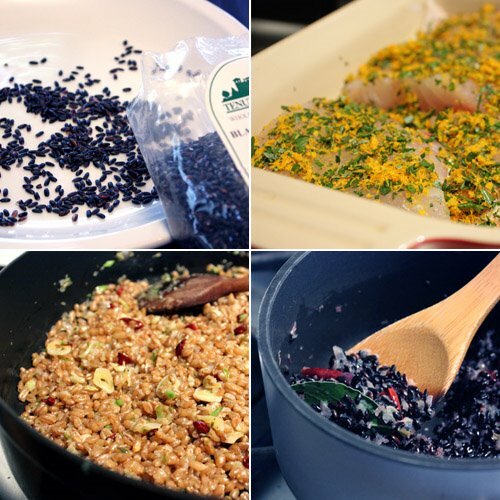 The green garlic and black rice. This looks positively delicious! I live just seconds from Lucques, but have never been (I know!) this is a gorgeous dinner. I am a new fan of farro and I have been seeing some green garlic in the farmers market lately. Hi Lisa, I just gave you an awrd!!! The friends award!! Why?? Check out my latest post!! Lisa, you are always cooking! You put the rest of us bloggers to shame. I love this post, and the photos make me happy. The recipe makes me hungry -- I'm very much at a stage in my vegan journey where I'm missing fish tremendously. When I rejoin the pescetarian world, this is high on my list of things to make. My husband got me into black rice a few years ago, and we try to eat that instead of white rice with every opportunity we can have. But I think with your flavor additions to the rice, I might never go back to white rice again! What an amazing idea Lisa. I just need to find farro now! Ricardo: Thanks! Farro is an ancient grain. It's grown in the Middle East and in Italy. The flavor and texture are similar to barley. What a delightful combo! This refined dish must taste fantastic!